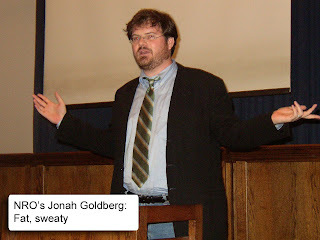 Sweaty, tubby National Review Online contributor Jonah Goldberg popped up predictably on Hannity and Colmes last night. The wheezing bag of type 2 diabetes, who owes what he calls a career to his shameless hustler of a mother, appeared in support of his latest National Review Online column. Arguing that ads in protest of California's Prop 8 - which rescinded the constitutionally guaranteed rights of gay couples in the state to marry - unfairly singled out Mormons for retribution in the wake of the measure's passage, Goldberg the Lesser bleated that people of other faiths had also supported it. Set aside for the moment the fact that the Cult of Jesus Christ of Latter Day Saints contributed disproportionately to Prop 8's passage - $22 million, by conservative estimates. What killed me, and what evaded chunky papist Hannity's notice, was Goldberg's characterization of Jews. Citing a commercial in which Mormon weirdos are depicted raiding a lesbian couple's house, stripping them of their wedding rings and shredding their marriage license, Goldberg hypothesized an alternate version of the ad: "Imagine a commercial that featured two Jewish guys at the door... You know, hook-nosed and slimy-looking." I'm not saying, across the board, that ethnic slurs are bad. I ask only that you show a little creativity.